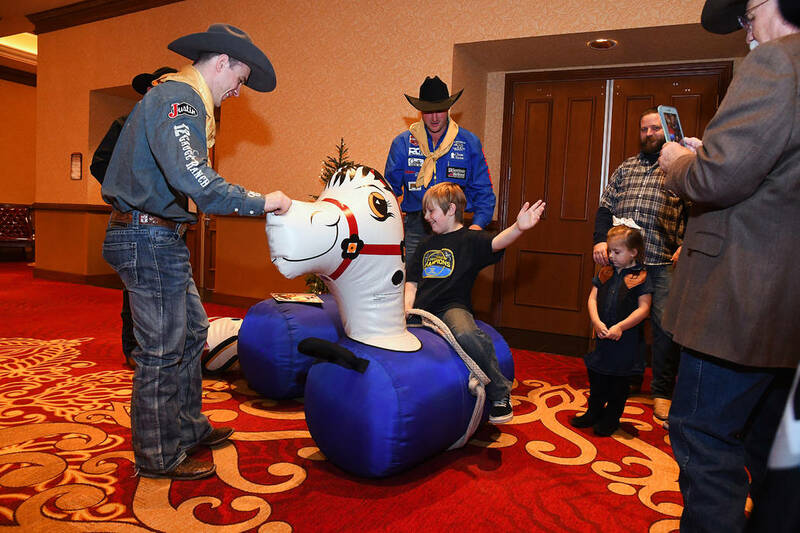 Here at the Wrangler NFR, kids were first treated to the Golden Circle of Champions Banquet at the South Point, where each child was paired with a contestant as a buddy. For the first time, the National Finals Rodeo has partnered with the Santa Maria Elks Rodeo to offer the Golden Circle of Champions. The event brings in 20 children and their families from around the country that have previously or are currently fighting life-threatening cancer. Dorian Millett, middle, hangs on during a ride on an inflatable bouncy horse as Wrangler NFR contestants Tim O'Connell, left, and Kyle Irwin cheer him along during Sunday's Golden Circle of Champions Banquet at the South Point. The event brought in child cancer patients and survivors for a day and night of rodeo fun. Photo by Steve Spatafore/NFR. 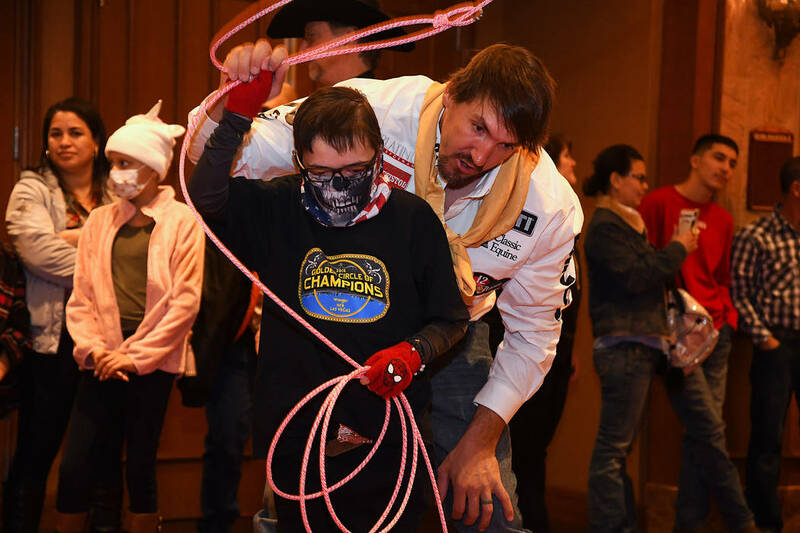 World champion steer wrestler Tyler Pearson gives a roping lesson to Gavin Kilcullen of Henderson, one of the children invited to the Golden Circle of Champions Banquet on Sunday at the South Point. The event is a benefit for pediatric cancer patients and survivors. Photo by Steve Spatafore/NFR. Wrangler NFR bull rider Joe Frost, right, checks out the roping form of Takota McAllister of Red Bluff, Calif., during Sunday's Golden Circle of Champions Banquet at the South Point. The event benefited pediatric cancer patients from Southern Nevada and children from several other states, as well. Photo by Steve Spatafore/NFR. Wrangler NFR barrel racer Hailey Kinsel and her new buddy Aileen Say Sanchez of Las Vegas are all smiles during the Golden Circle of Champions Banquet on Sunday at the South Point. 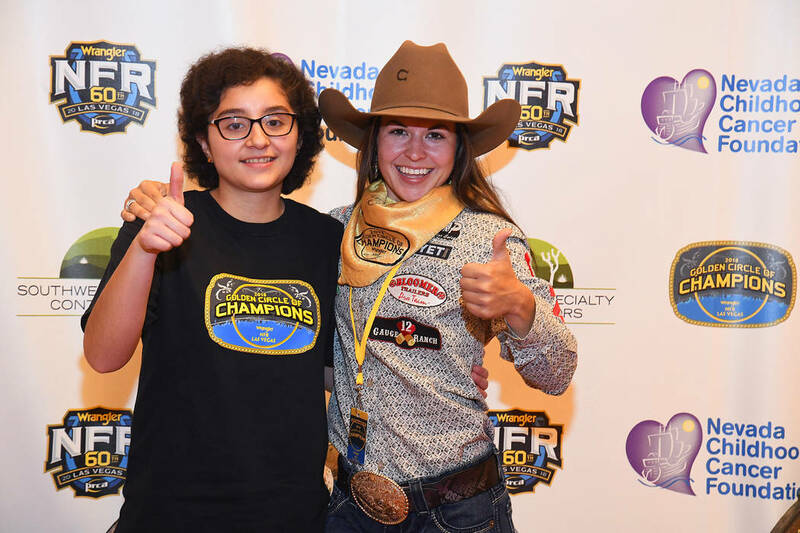 The Golden Circle event, to benefit pediatric cancer patients, also included a trip to Sunday night's rodeo go-round at the Thomas & Mack Center. Photo by Steve Spatafore/NFR. The Wrangler National Finals Rodeo is a massive event, no question. But the sport of rodeo has always been about community. After all, the Wrangler NFR is built upon hundreds and hundreds of rodeos across the country, all year long, far from the glitz and glamour of Las Vegas. Such as the Santa Maria (California) Elks Rodeo, one of countless PRCA events that look to connect with the community it represents. But in one of the most recent examples, the Santa Maria rodeo quickly went way beyond its borders and is on the brink of going nationwide for a fantastic cause: helping children battle cancer. In May 2016, 12-year-old Lexi Brown died. She fearlessly fought cancer, advocated on behalf of other kids with the disease and was a big rodeo fan in Santa Maria. Tina Tonascia, chief operations officer for the Santa Maria Elks Rodeo, wanted to carry on Lexi’s fight. From that small start came the Golden Circle of Champions, now a staple of the Santa Maria Elks Rodeo. Along with raising awareness and funds for pediatric cancer patients, children and their families are also invited to the rodeo each year and treated like royalty for a day. Initially, it was just a local event. Not anymore. With an assist from James Miller, general manager of the Red Bluff (California) Roundup, Tonascia got in touch with Wrangler NFR and Las Vegas Events officials this past June about her local charitable effort. Then the Nevada Childhood Cancer Foundation was brought in. And in short order, the Wrangler NFR was on track to host a Golden Circle of Champions this week. On Sunday, they all did it. Tonascia’s event back home honors 10 pediatric patients each year from the Santa Maria community. At the NFR, that expanded to 20 children — 10 from around the country, and 10 from Southern Nevada. Ultimately, the goal is to have rodeo committees around the country add the Golden Circle to their calendar. 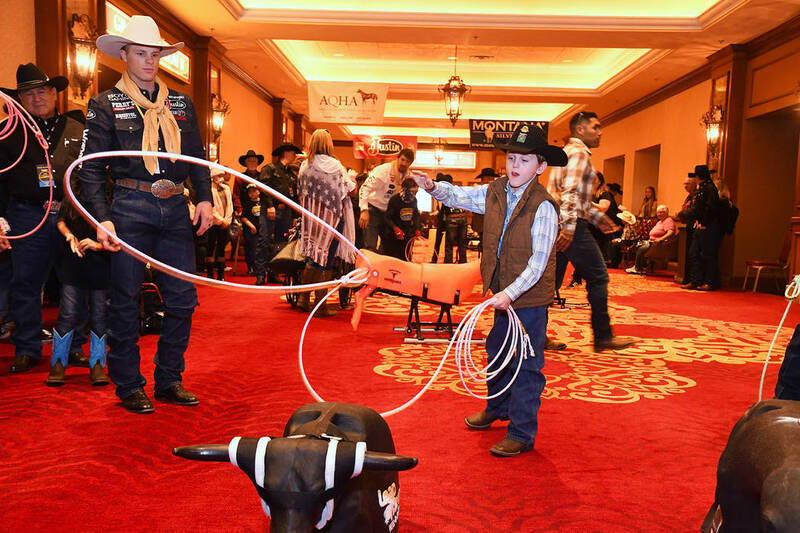 At the Wrangler NFR, kids were first treated to the Golden Circle of Champions Banquet at the South Point, where each child was paired with a contestant as a buddy. They got to try their hand at roping and riding bouncy inflatable horses, got a great meal and learned more about the sport of rodeo. Then they got to attend Sunday night’s fourth go-round at the Thomas & Mack Center, with another dinner inside The Shoe, then seats to take in all the action the Wrangler NFR could serve up. Eight-year-old Dorian Millett of Las Vegas, diagnosed with leukemia at age 3 but thankfully now in remission, was paired up with steer wrestler Kyle Irwin for a day he won’t soon forget. Indeed, Irwin was dealt a defeat — one he happily accepted. In fact, all the kids got a rodeo belt buckle, from Montana Silversmiths, the same company that gives out the nightly go-round buckles for events at the Wrangler NFR. And although it was all the kids who came out winners Sunday, Irwin felt like he won as well, with his day brightened as much or more by Dorian. So happy, in fact, that Irwin took second in the steer wrestling on Sunday night, collecting a check for $20,371. “I believe it’s divine intervention. I do, I do,” Irwin said. It was a divine intervention day for William Strange, too, as the Golden Circle event went a bit beyond pediatric cancer to include the 10-year-old from Reno. At 6 years old, William was diagnosed with autoimmune encephalitis, and that developed into a still unknown type of autoimmune epilepsy. As his mother Lora Strange explained, seizures became so frequent at one point that William had to be put in a five-day coma to stop them. Immunotherapy has helped get William back on track, but he’s still working to overcome learning disabilities, and the seizures, though not as persistent, continue. Rather than contract the typical childhood maladies such as colds, William’s body responds by having seizures. But Sunday was an opportunity for William to forget about all that, and for his family to educate others, so that his unknown condition can become better known and ultimately treated. “We got this amazing experience here, and we hope to spread the word about his condition,” the happy mother said. With the Golden Circle of Champions now casting a much wider net, the word on William’s condition definitely spread, as did awareness for Dorian and the rest of the pediatric cancer patients. As the pre-rodeo dinner wrapped up and the kids prepared to take their seats in the arena Sunday night, Tonascia marveled at the events of the day. “I’m numb right now. In my wildest dreams, I would’ve never anticipated this turnout,” she said. “The luncheon today and rodeo tonight, the joy of these kids and their families. Some of them have never been to a rodeo before, let alone a rodeo of this status. They embraced it much like Lexi Brown did the battle against cancer. Her parents also attended Sunday’s festivities, and dad Jon Brown put the most amazing positive spin on all that his daughter’s life has become, 2½ years after she passed away.